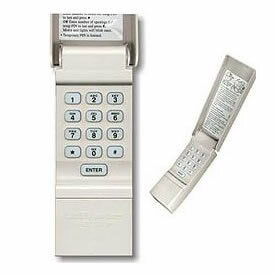 Liftmaster 976LM is one of the most popular Liftmaster’s Garage Door Keypads. And there are many reasons for that. First most important is easy installation and easy to use. You can be the biggest dummy and you will still know how to operate this Garage Door Keypad. Let’s see first where you can use it. Garage Door Keypad Liftmaster 976LM works with Liftmaster, Chamberlain, Sears, Craftsman and Raynor garage door openers with red and orange learning button. If you have purple learning button, then you need LiftMaster 377LM keypad. You can check which learning button your garage door opener has by opening the rear translucent light bulb cover. You should easily see it there. This Garage Door Keypad is also very secure. Keypad has a Security+ anti-burglary safety feature. That means that every time someone uses your garage door opener is used, the code is changed. But don’t worry, your personal code will stay the same. This keypad also has one feature that many others don’t. And that is when you mistype your code, you have to wait a few seconds and then press your code again. Not with this keypad. If you mistype code you can just start typing your code right away, because this keypad only remembers last 4 numbers. That’s not all. LiftMaster 976LM also have temporary password option. That means that you can program a code that will work only for a limited number of hours or number of openings. Perfect for times when you are not home and you need to let in neighbor or maintenance people. How to program this Garage Door Keypad? As I said before, it’s very easy. Press and release the learning button, enter a four (4) digit code on the keypad that you want to use and then press and hold enter button until your garage opener light blinks. And that’s it. Easy right? If you want to change the code sometime letter, you just have to repeat the same procedure. What do buyers think about Liftmaster 976LM keypad? Before writing about LiftMaster 976LM, I decided to surf online and see what buyers are saying about this keypad. I found many good reviews, few semi-good reviews, and very few bad reviews. There is always someone complaining about something, right? The average rating was around 4.5 out of 5. OK, let’s see what they wrote about it. Some of the buyers even report to work not only with openers with red and orange learning buttons but also Liftmaster openers with green, yellow, white and gray learning buttons. How cool is that? In those few bad reviews that I found, there were only a few smaller problems. One of those is that you have to press the code to close the door. But again, almost all keypads work like that. The other thing that someone didn’t like was robber buttons. OK, there is a reason for that. Most keypads have rubber buttons because it offers better protection against dust and humidity. And that is necessary for the longer life of keypad. Some other guy reported, that his keypad has a very short range of the transmitter because the military is jamming 390 Mhz frequency, that this keypad is using. I Made the research and I found that this is partly true. Problem with frequency jamming only experiences those who live very close to military bases. This doesn’t affect the big majority of garage door opener with 390 Mhz frequency around the country. This could be a problem only for a few users. Of course, there could be another reason for small range too. In bigger part that would be too much of iron between opener and keypad. But that is really, really rare. As you can see, LiftMaster 976LM is a quality Garage Door Keypad. Is easy to mount (only 2 screws), easy to programme, has temporary password option and works with many garage door openers. You also don’t have to wait if you mistype your code and retype new one right away. Users have mainly good experiences, has Security+ protection, good ratings, and many other great features. I was looking where to buy one for a good price and found a great deal on Amazon. Check it for yourself.